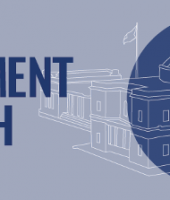 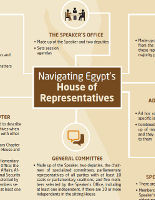 TIMEP’s infographic “Amending Egypt’s Constitution” helps users better understand the process for amending the constitution as laid out by Articles 133 to 143 of the House of Representatives’ bylaws and Article 226 of the constitution. 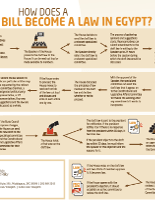 Infographic: How Does a Bill Become a Law in Egypt? 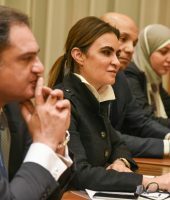 When, on January 10, 2016, Egypt’s current legislature gathered under the dome of the parliament building, the country completed the final step in its “democratic roadmap.” This roadmap had been announced in 2013 by Abdel-Fattah El Sisi, then minister of defense, upon the ouster of President Muhammad Morsi. 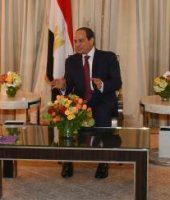 Sisi declared that the transition to democratic rule would require amending the constitution, the selection of a new president (through which Sisi rose to power) and parliamentary elections, held over six weeks in late 2015. 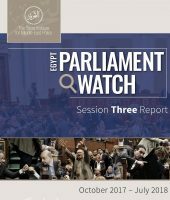 But simply convening as a parliament does not necessarily mean that body is truly engaging in democratic practice; further analysis is necessary to examine the legislative function of the parliament and the ability of representatives to uphold their sworn oath to respect rule of law and the interests of the Egyptian people. 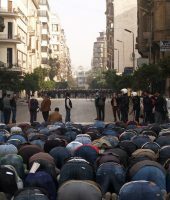 Examines actor dynamics, monitoring key statements and activities in Egypt’s political parties and state bodies. 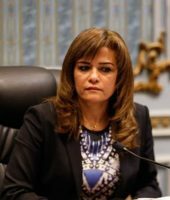 It is TIMEP’s hope that this project and the analysis found herein will be of use to those interested in Egypt’s progress toward more democratic representation, which was and has been a key demand since the 2011 revolution. 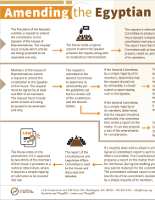 As with all of TIMEP’s work, it is intended to inform policies that will support the role of truly democratic institutions as part of a holistic policy program that holds human rights and rule of law as both inherently valuable and integral to security, stability, and prosperity.